When Mountain Man (who grew up near Boston) and Lindsay (who has now lived in Boston for almost five years) asked me what I wanted to see while I was visiting, I said, "I only care about seeing two things: The Green Monstah and really old stuff." 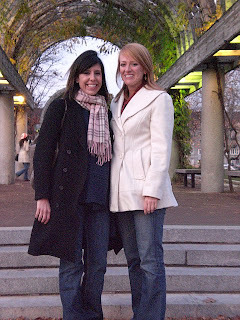 I had only been to Boston one other time while on a road trip with my friend Emily. It was the end of June and the thermometer on my car read 106 degrees. We walked around Harvard, stopped at a friend's apartment that didn't have air conditioning, ate Chicago style pizza (in Boston?) at a chain restaurant and left. Total time in Boston: 4 hours. This weekend was going to be different. Team Whatever was still in effect in the sense that we had no set schedule and no agenda to follow. But I wanted to see Boston. Really see it. So that was the plan. 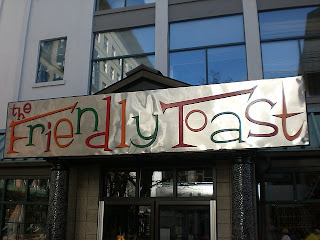 Lindsay and I ate brunch at the Friendly Toast in Cambridge, a diner full of vintage decor, hipsters with short bangs and tattoos and an abundance of great breakfast food. Mountain Man returned from his parents' house, met us at the 'T' and off we went to explore the city. Day 42 would be filled with things that I had never seen or done before, including walking the Freedom Trail, checking out Boston harbor and eating in the North End. Since they moved to Boston, Lindsay and Tarek have had a revolving door of visitors come and see them. Lindsay said she's done just about every tour there is to do in the city, and there are a lot to choose from. Walking tours, trolley tours, the Duck Tour. I wanted to go on a Duck Tour since I decided to go to Boston and heard the words, "Duck Tour." The Duck Tour takes place on a World War II amphibious landing vehicle allowing participants to see Boston by land and by sea. Besides offering a thorough tour of the city, the boat also quacks at people on the street as it passes by, which in my opinion, makes it an obvious winner. Mountain Man and Tarek both cringed when I told them separately that I wanted to do it. Tarek also laughed and said "no way." Mountain Man agreed to go along if I wanted to, but I could tell he was hoping to find a way to show me the city that was a little less obvious. Something that didn't scream, "HEY EVERYBODY, LOOK AT ME! I'M NOT FROM HERE!" After some discussion, I decided I don't need a fancy duck boat or a tour guide dressed up in colonial attire to see Boston. I had Lindsay, who has taken, and now given, every tour in the city, and Mountain Man, who grew up going there. Between the two of them, I knew I was going to see and learn plenty about Boston. 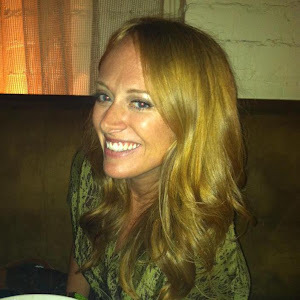 Like CK in Yosemite, Lindsay could have told me just about anything and I would have believed her. Lindsay: Did you know that's where John F. Kennedy lived when he was a Senator? Lindsay: Did you know only seven colonists died in the Boston Massacre? Lindsay: Did you know that this is where Mother Goose was buried? Me: Um, no. I didn't even know Mother Goose was a real person. I thought she was made up. The best way to see really old stuff in Boston is to simply look around. It's everywhere. 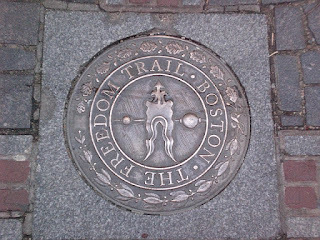 But the best place to see it in abundance is on the Freedom Trail. It's where history went down. 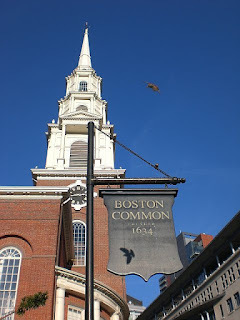 The Freedom Trail starts at Boston Common and travels two and a half miles through the city's historic landmarks including the Massachusetts State House, Park Street Church and King's Chapel. 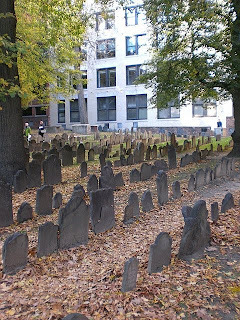 The Old Granary Burial Ground, because I know you want to know, is where Mother Goose, Paul Revere, Sam Adams and John Hancock are all buried. The cemetery looked liked the set of Thriller. I thought it was awesome. The entire trail is marked by a red line which I found to be genius, and most helpful. Thank you, Boston Department of Tourism, for making it so easy. Like Mountain Man said, I could already smell freedom in the air, and now, thanks to this red line, I could see it too. I was counting on both of my tour guides to share the responsibility of telling me about Boston history, but it became evident rather quickly that Mountain Man's knowledge about Boston started and ended with sporting events he attended at Fenway Park and Boston College. He also shared with us that when he and his friends got their driver's licenses, they would drive into the city and hang out at Quincy Market. Lindsay was more than able to pick up his slack, and she shared her wealth of knowledge with us both. She even led us away from the Freedom Trail momentarily so she could show us the birthplace of Benjamin Franklin, where there is now a "Sir Speedy" copy center. The Freedom Trail ends at Bunker Hill, but we didn't make it all the way there. It was cold and getting dark, so we opted for a coffee and bathroom break instead. Right in front of Faneuil Hall we saw a group of hip hop dancers surrounded by tourists clapping off-beat to the music. Then we saw a contortionist hanging upside down in front of Quincy Market. No wonder Mountain Man hung out here when he was in high school. It was just like colonial times! The day ended with our own spontaneous and mini-Boston pub crawl and a delicious Italian dinner in Boston's North End. We returned to Cambridge to meet up with some of Mountain Man's friends, who like San Francisco Elizabeth, knew little to nothing about me or this situation. Instead of waiting for me to go to the bathroom, however, Mountain Man and I just decided to tell them the story about how we ended up there, together. It may have been nice to quack at people on the street, but my tour of Boston, especially the company, was pretty stellar. What a fun trip! I hope you had fun with Lindsay...I also had the chance to visit her when I was in Boston. Wow, they put a copy center where Benjamin Franklin was born? You would have thought it would be a historical site by the city. Weird. Day 52: Hell of a Season, Baba Ghanuj! Day 51: Finally, I'm in! Day 47: And Bingo Was Its Name, Oh!